I do not feel competent to say what entity this bowl was manufactured for originally. I have found differing information on branches of the military that use this symbol, and there is no identifying logo on the bottom. If you will look at enlargement #2, you will see the complete backstamp. From the information, I've been able to find on Jackson's dating code the G is for 1956. 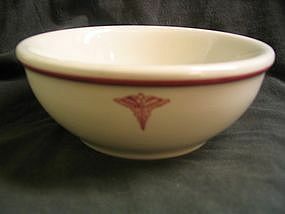 It is an extremely heavy bowl and holds approximately 16 ounces. No chips, cracks, breaks or rough areas. The finish and trim appear to have little to no wear. I will be glad to provide additional photos. I need your zip code to calculate the postage.